Today I decided to setup my Chameleon V1 antenna in the garden in London City and work some CW QRP 10w. Conditions are reasonably okay on the Bands but the noise in the city here is a tough battle to fight at the best of times on the bands. 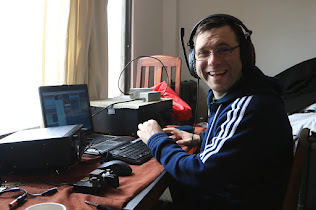 I had my first CW contact on 5MHz (60m) QRP today with GW3UEP - Ron on 5.260MHz at 16:22UTC the QSB was deep at that time, both reports of 559 raised an eyebrow for me with regards to the 60m propagation. Thanks to Ron for my first QSO on a new band for me and also for his patience with the QSB during our QSO. I'm looking forward to exploring more conditions on the 60 meters band as it has very interesting propagation characteristics, just lying approximately halfway between 80 meter (3.5 MHz) and 40 meter (7 MHz), the 60 meter (5 MHz) band forms a communication bridge when propagation effects make use of the 80m or 40m impossible for local-to-medium distance communications. The 5Mhz band is apparently less affected by D-Layer absorption than on the 80 meter band, the 60 meter (5 MHz) band is an ideal candidate for the Near Vertical Incidence Skywave (NVIS), the most commonly used technique capable of providing seamless local-to-medium distance HF communications. Here is a simple QRP setup that I'm running at the moment in West London. I'm going to test a Loop antenna and a Dipole if I get the time over the next few days so I hope to work some of you on the key on 60 Meters 5MHz band. Thanks David, Yeah 10 Metres can be really fascinating, if not occasionally challenging to operate on. At peak times of the solar cycle when many sunspots appear on the Sun's surface, 10 Metres can be alive with extremely long-distance signals, refracting from the F2 layer in the ionosphere and with even the simplest QRP setups you can get a lot from that band. I look forward to the openings during the summer, lets hope there is good Sunspots to make it possible.